The subtropical Ogasawara Islands have been dubbed the Galapagos Islands of the East, because the contain a large number of flora and fauna found nowhere else in the world. Created by undersea volcanos, they have sheer cliffs covered by layers of oval-shaped pillow lava and have never been connected to any mainland bodies. Until the arrival of man all the flaura and fauna on the islands evolved from organism carried by the wind or sea. 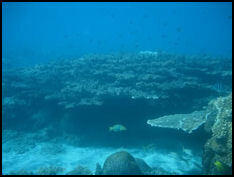 The Ogasawara Islands were designated as a World Natural Heritage Site in 2011. Tetsu Joko wrote in the Yomiuri Shimbun, “Approaching Chichijima island one sees a gigantic rock wall rising into the sky out of the cobalt blue ocean. A large, reddish-brown, heart-shaped feature that looks like it has been engraved in the wall is known as "Heart Rock" among residents of the Ogasawara Islands, of which Chichijima is a part. The rock surrounding Heart Rock is mostly a type of andesite called "boninite," a fine-grained rock that was created by underwater volcanoes about 48 million years ago and then rose to the surface of the sea with crustal movement. Such a massive amount of boninite in the ground is quite rare. 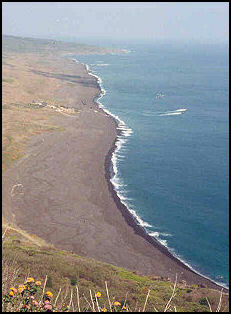 Much of the islands are composed of boninite s produced when magma cools near the Earth’s surface. Of the 447 plant species found on the island chain, 161, or 36 percent, are found nowhere else. The islands are also home to an unusually high number of land snail species. In the forest of Chichijima island, needle-thin burgundy plants shoot up from the mossy ground. There are suzufuri hongoso [Sciaphila okabeana Tuyama],an indigenous species only about four centimeters tall, and adorned with flowers and fruits just three millimeters wide.The recent UNESCO designation of the islands is expected to bring more tourists, which could also mean a threat of destruction of the natural environment. 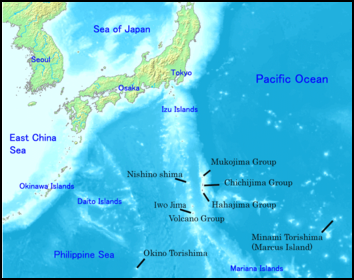 The Ogasawara Islands are comprised of 30 large and small islands, which are divided into four groupings: the Chichijima Islands, the Mukojima Island, the Hahajima Island and the Ninamitorish Islands. Only Chichijima and Hajima---with population of just over 2,000---are open to tourists, Chichijima can be reached a once-a-week ferry from Takeshiba pier in Tokyo. The ferry lands at Futami Port to Chichijima and takes 25 to 30 hours and cost between $200 and $550 one way. Plans to build an airport and introduce high speed boats have been shelved for environmental and cost reasons. Minamijima is an uninhabited island located about 1.5 kilometers from Chichijima. There already too many tourists have trampled plants and exposed the island’s red soil. Japan’s Environment Ministry and the Tokyo metropolitan government have teamed up to protect the environment on the island by limiting walking routes as well as the number of tourists. The efforts have gradually paid off as the plants are coming back. Hahajima is famous for birds. Minamjima Island boasts a rare underwater limestone sinkhole and beautiful white sand beaches and dunes There is good snorkeling at Anijima island underwater park A number of World War II wrecks lie on the ocean floor. . In December 2006, Tsunemi Kubodera, a scientist at the National Science Museum, caught a giant squid at dept of 650 meters about 27 kilometers off the northeast coast of Ototojima island in the Ogasawara Islands. The squid was not fully grown. It measured 3.5 meters despite have its two longest tentacles severed. It is is estimated that of the tentacles were intact the squid would have measures seven meters in length. Chichi became an important whaling station in the early 19th century after good supplies of freshwater were discovered there. Among those that stopped there were Commodore Matthew Perry and the writer Jack London. In 1944, former U.S. President George Bush, then a 20-year-old pilot, was shot down offshore and rescued by a submarine. During World War II, there were reports of cannibalism taking place there. Chichijima is home to Japan’s only aquarium dedicated to turtles, particularly green turtles, and most of the hotels in the Ogasawara Islands. Activities on the island include swimming with dolphins and whale watching and turtle watching. The number of green turtles coming ashore to lay their eggs is increasing at a rate faster than anywhere else in the world. Sperm whales are often seen at a site about one hour from Chichijima. In the late autumn mothers are spotted with their calves. Humpback whales breed in waters off the island from December to May, peaking in February and March. According to Oasawara Whale Watching Association about 20 whales a day can be seen from the Chichijima island observation tower if the conditions are good. The waters off the island are 200 meters of shallower with gentle waves, providing good breeding conditions. American forces landed Iwo Jima (170 miles south Ogasawara, 1,250 kilometers south of Tokyo, halfway between the main islands of Japan and Guam) is where the famous World War II battle took place. 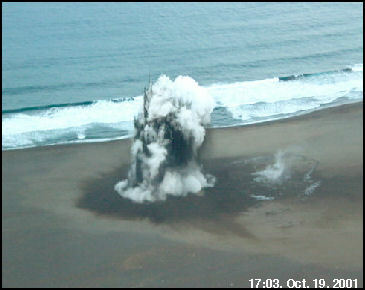 Part of a group of volcanic islands called the Bonins, it is still off limits to travelers because of high number of unexploded shells on the island. Iwo Jima is also very active volcanically. Some geologists speculate that the volcanos on Iwo Jima are ready to blow any time and the island my be the next Mt. St. Helens or Pinitabu. Iwo Jima means “Sulfur Island.” The island rose 46 centimeters between June 2006 and January 2007, growing 12 centimeters in a one month period in November and December 2006. This was more than it rose before it erupted in September 2001. Evidence of a steam explosion was seen late in 2007. Iwo Jima is five miles long and two and half miles wide and covers 22.4 square kilometers, with 550-foot-high Mount Suribachi being the highest point on the island. Many of the original inhabitants were New Englanders who got dropped here by whaling vessels. A man called Uncle Charley Washington, who was 87 in 1968, for example, was the son of a black cabin boy who jumped ship in 1843. Iwo Jima is now a Japanese military base as it was at the beginning of World War II. Iwo Jima can be visited only with military permission and usually only on military transport, usually a C-130 Hercules from Okinawa. U.S. Marines make periodic visits there to boost morale. Visitor can visit the cave of the Japanese commander. It sits I 30 feet below the surface of the land and is still littered with possessions of Japanese soldiers who died there in the 1944 battle. Toshima Island (18 miles southwest of Oshima) is the smallest of the main Izu islands, with a circumference of only eight kilometers. The island is mountainous and there are no swimming beaches. 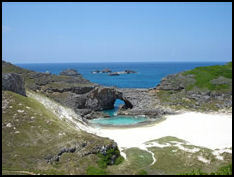 Niijima (35 miles south of Oshima) is pleasant island that covers 27 square miles. Among its attractions are quaint fishing villages, mountain scenery, flowers, hot springs with ocean views, beaches, friendly guesthouses, houses made of volcanic rocks, bird rookeries and a museums with artwork from imprisoned artists and a collection of surfboards. 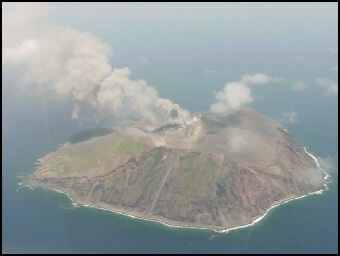 Shikine-Jima Island (4 miles south of Niijima) is small, covering only 3.8 square miles. It boasts swimming beaches, hot springs and lots of guest houses. Kozu-Shima Island (7 miles south of Shikine-Jima Island) is a small 18-square-kilometer island. 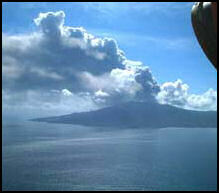 It has nice beaches and is dominated by an extinct volcano, Mt. Tenjo. Miyakejima eruption Miyakejima Island (120 miles south of Tokyo) is a volcanic island with 240 species of wild bird and dolphin swimming tours. 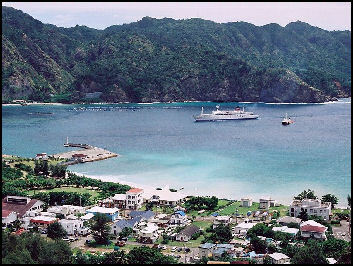 The island has a circumference of 36 kilometers and is the third largest of the Izu islands.